Home / Blogs / Why did I open a Bookshop? Why did I open a Bookshop? Why did I open a Bookshop? Was I bonkers? Well yes, I probably was bonkers to open a Bookshop but there was more to it than a slight touch of madness. One day my children decided to have words with me. Oh No, what can it be! They have something to tell me and I have to sit down. As you can imagine terrifying thoughts raced through my head, what had troubled them so much they felt I need to be seated. But it was worse than I could have ever imagined, much worse, it turns out it was about BOOKS. “Mother, the time has come when you must STOP buying books, the house is like a library and is bursting at the seams with piles of books. We have decided as your responsible children to ban you from the purchasing of any more books” and that was it … I was banned. I bought an e-reader but I couldn’t sniff the books or find anywhere to put my bookmark, so that didn’t work. I joined a library, but I never wanted to return the books and got fined a lot so that didn’t work. So, the only option left was to open my own bookshop, where I could surround myself with books every day and book sniff to my hearts content. With independent bookshops disappearing weekly and me being dyslexic, everyone thought I had completely lost my marbles (hush, no comments!). The challenges were terrifying and numerous, but I decided to go ahead and open a bookshop anyway, what had I to lose apart from money and my sanity!! 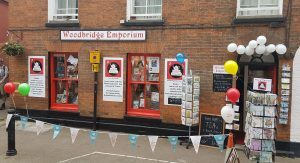 In May 2017, Woodbridge Emporium opened, and the madness really did begin. 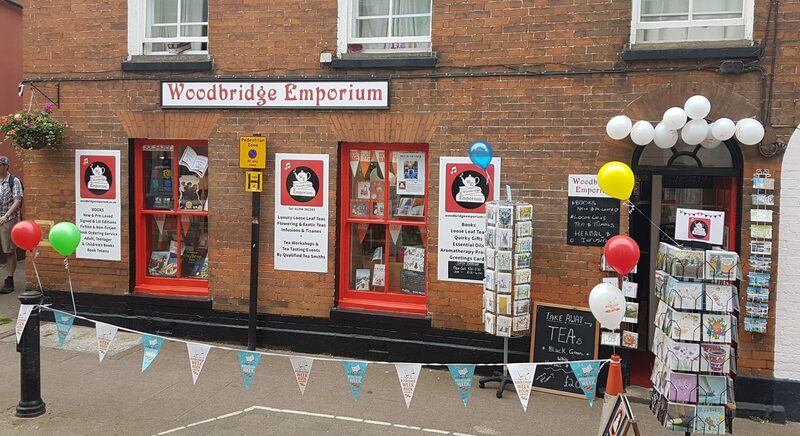 I wanted the bookshop to be part of the community and have a spiritual feel, whilst being able to offer educational and alternative books alongside the popular mainstream books. Has it worked? Well, our motto is now ‘Don’t compete, Be Different’ and different we will strive to be. Different as in, we love everyone, we are diverse and welcome all types of books and all types of people. We are going from strength to strength and the support from the community is awesome. Will opening a bookshop make me a millionaire? Hell no, but I will meet the most wonderful people, get to sniff the most amazing books and most importantly get to prove a point to my gorgeous daughters. And that point is that there is a way around every obstacle in life if you really want something bad enough and of course, being completely bonkers helps! And the TEA, how did all the loose-leaf tea come to be in the bookshop too? Wonderful story of the triumph of passion in life. I love books too. A friend of mine is a brilliant business man and a passionate advocate of understanding and demystifying dyslexia. He is dyslexic. I think your example would be inspirational in his work to change perceptions. Can I connect you? He will love what you do. Yes, of course, connect us.